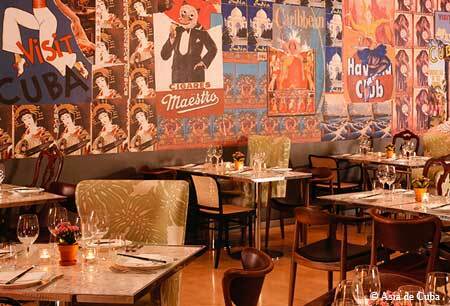 Fashions come and go but Asia de Cuba is as hip and trendy as ever. : It worked when it opened, so why change it? Asia de Cuba still pulls in the people who like to be seen against the Philippe Starck-inspired, crazily eclectic homage to Cuba. The décor mixes high camp with stark modernism: bare light bulbs hang over extra wide tables designed to promote the sharing ethic; pillars are decorated with Cuban photographic images, vintage books and radios; staff are dressed to party and the voltage is high. The menu defies categorization, though it reflects the fact that Cuban cuisine is heavily influenced by Chinese ingredients. There’s a very wide selection, from an Asian noodle box to sweet soy salmon, from Thai beef salad to Cuban coffee-crusted sirloin steak (now when did you have that last?). It’s inventive cooking and when it hits the spot justifies the high-end prices. But then, with the entertainment value of all that people-watching thrown in, it’s worth every penny. Set lunch 2 courses £18.50, 3 courses £22.50. Pre-theater 2 courses £22, 3 courses £27. Tasting Menu £60.